The Castro Valley Creek restoration involved removal of an underground 300-foot culvert and “daylighting” this section into a more natural channel. 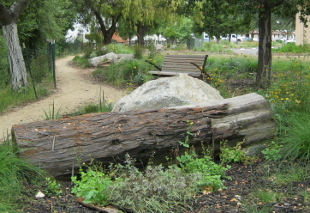 This restoration of the urban stream created new habitat for birds and riparian wildlife, provides flood protection for the adjacent new Castro Valley Library and Castro Valley neighborhoods, and incorporates art and education in an urban setting. 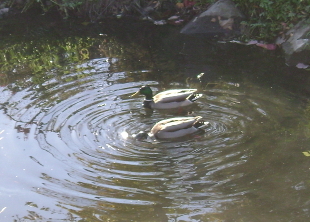 The natural design helps improve water quality by slowing and filtering the flow of water. This site has become a scenic destination and educational community center and increases access to public transportation and the town’s commercial area. The project won an ABAG Growing Smarter Together sustainability award for Preserving and Protecting the Environment. Questa’s services included design and permit assistance for the 1,000-foot creek reach adjacent to the Castro Valley Library, with 300 feet of creek daylighting, bank and creek bed stabilization, native plants, irrigation system, permeable paths, site furnishings, educational and interpretive exhibits, custom art, construction assistance, landscape installation and maintenance. The project demonstrates site sustainability and reuse, with a new pedestrian bridge made from a converted railroad flat car. 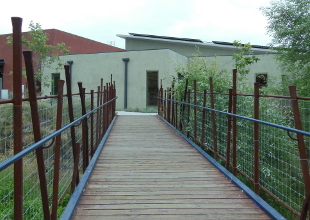 The bridge connects the library to the opposite side of the creek where children play at a new playground and learn about nature and science at a creekside amphitheater. With site constraints and a channel gradient of nearly 2.5%, creative design was needed to meet the project’s creek daylighting and restoration goals. The design incorporates biotechnical bank stabilization and uses a series of rock boulder step pools leading into a new headwall and wing wall assembly. Questa’s design work included hydraulic design of the channel, development of construction plans and details for construction of the step pool sequence from the culvert headwall and wing walls, daylighting to the existing channel, engineer’s estimate, design and implementation assistance using native riparian trees, shrubs, and grasses, public access components, site furnishings, habitat features, and art coordination. 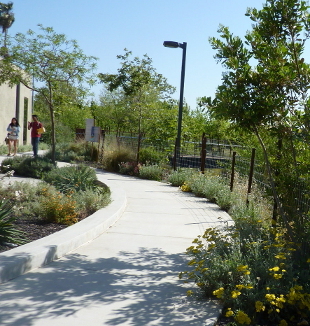 Questa provides ongoing permit compliance, implementation and management of the site, including planting and irrigation, permeable path, and Bay-Friendly landscape components.